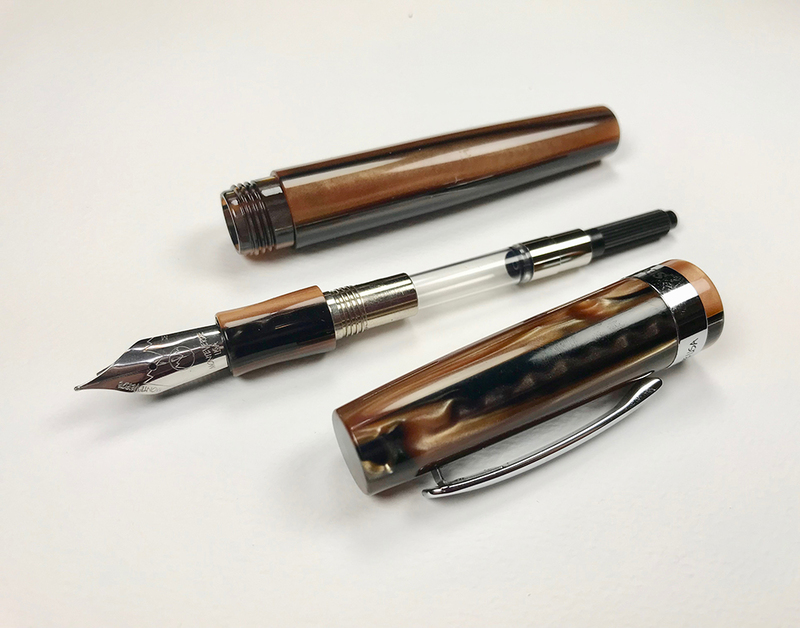 Thanks to PenChalet.com for sending me a Monteverde Giant Sequoia to review. This is my very first pen review! 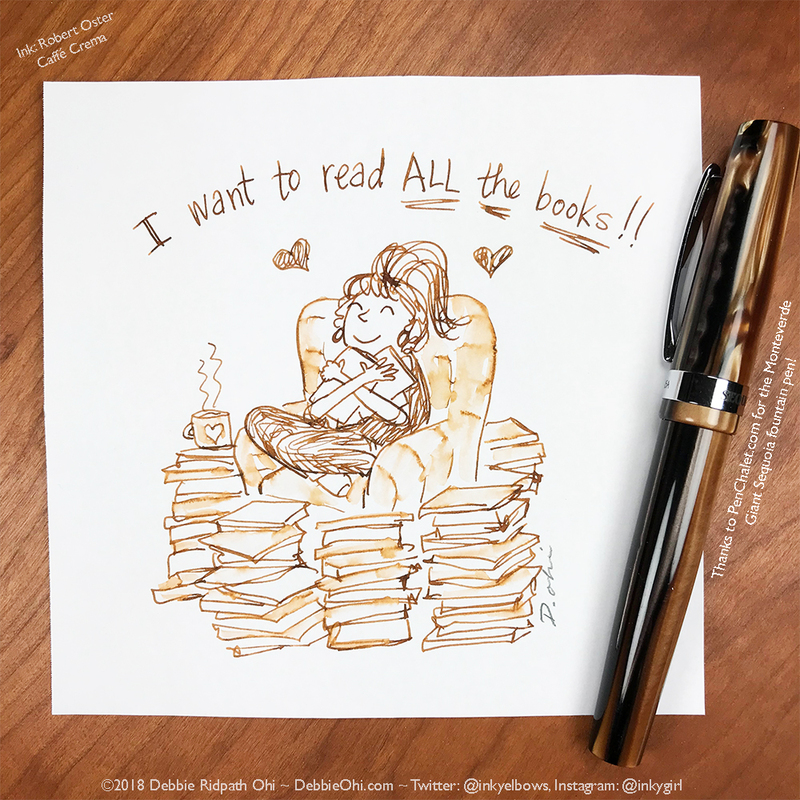 It's probably not going to be your typical review, however, since I tend to use my fountain pens for drawing (I write and draw children's books for a living) as well as writing. The pen feels a bit big in my hand so although I love using it, I will probably give it to my husband (who loves the bigger pens). This would, in fact, make a wonderful gift for anyone who does like bigger pens. 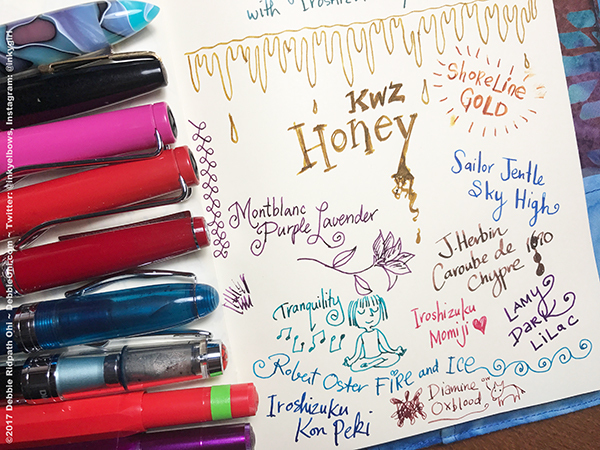 In the video above, I was using KWZ Honey ink. If you have any specific questions about my experience with the pen, feel free to ask them below and I'll try to answer. 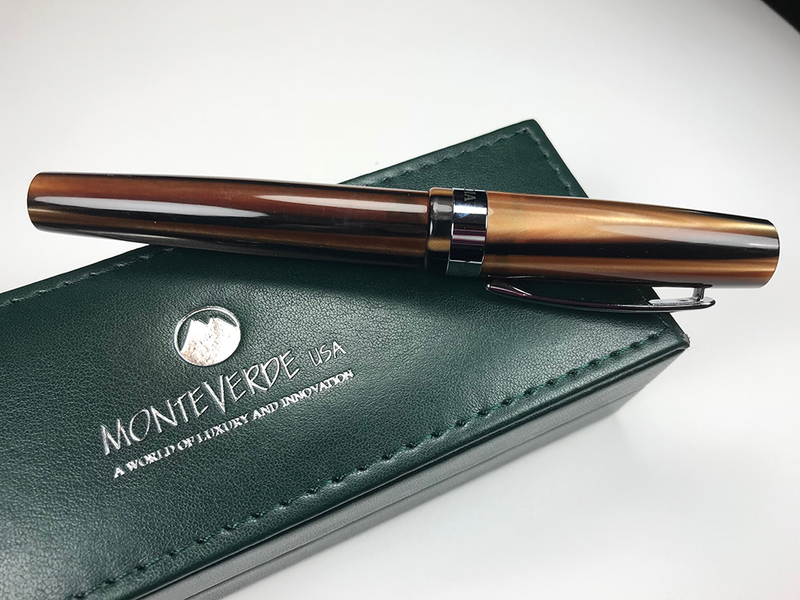 Thanks again to Pen Chalet for sending me this Monteverde Giant Sequoia to try out! 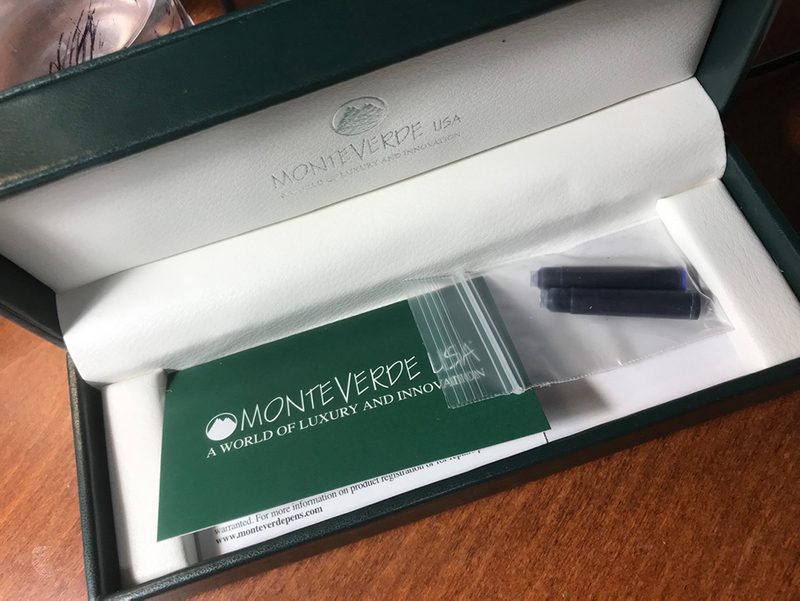 Pen Chalet kindly sent me a Monteverde Giant Sequoia. 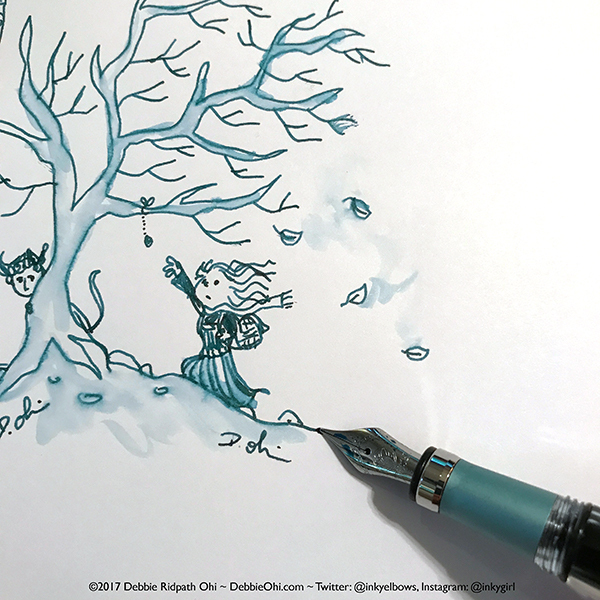 It is gorgeous, and I immediately had to ink it up with some Robert Oster Caffé Crema for a quick doodle. I'll be posting a proper review once I've had a chance to try it out for a while. 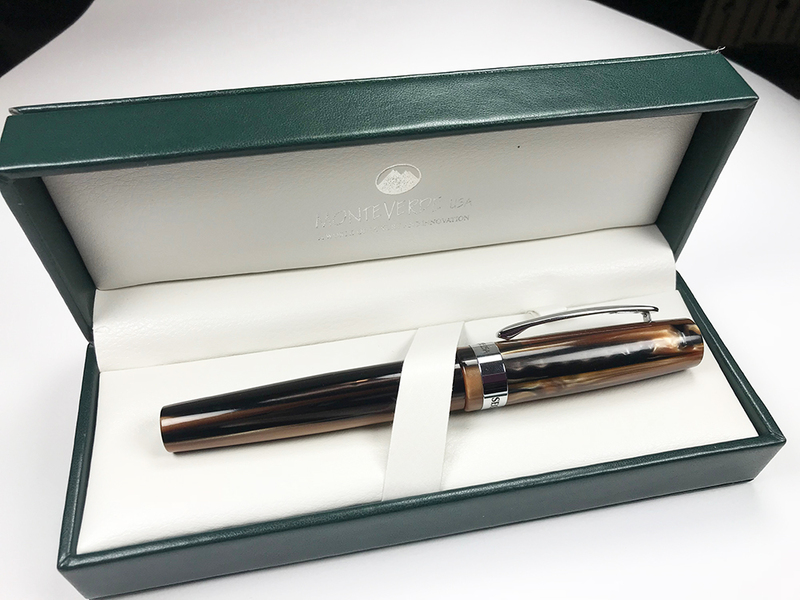 THANK YOU, PEN CHALET! I lovelovelove my new pen. It was easy to fill, started up with no problems, love how it doodles. 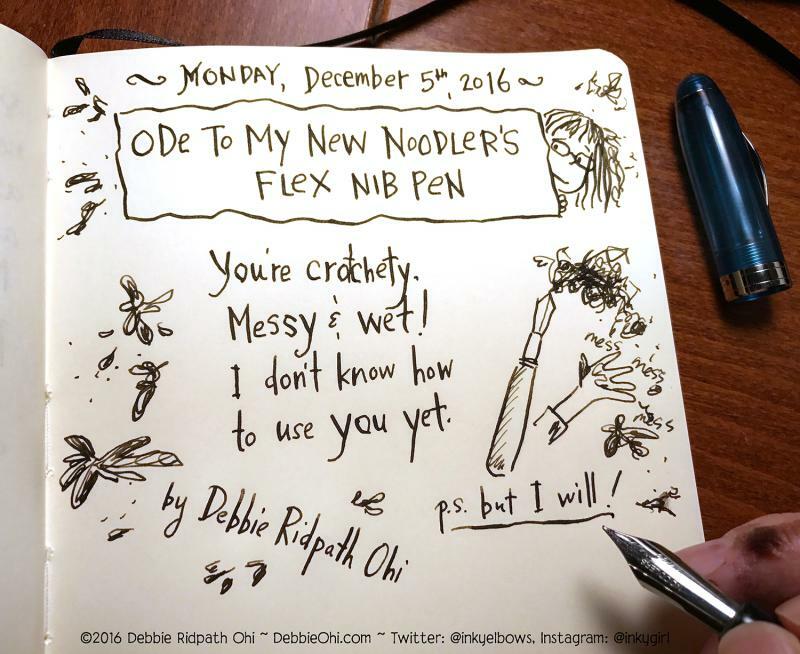 I'm giving my Noodler's Ahab another go. 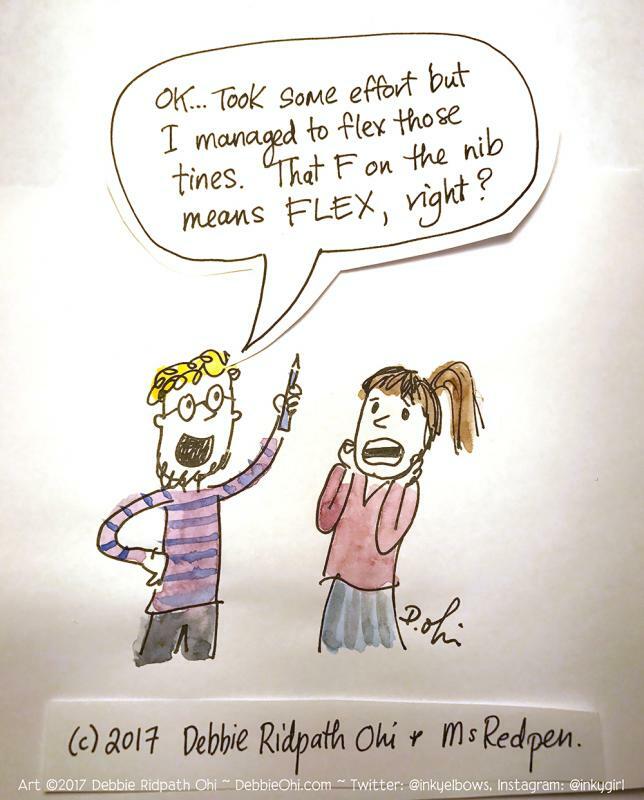 I like the bit of flex it gives, and I don't have to worry about springing the nib (I do have nicer pens now, so am aware of the difference). BUT it always ALWAYS leaks on my middle finger (see photo). I've tried adding silicone grease to the bit where the body connects with the writing bit. p.s. For the drawing above, I used Noodler's Black Swan In Australian Roses, one of my new favourite inks. 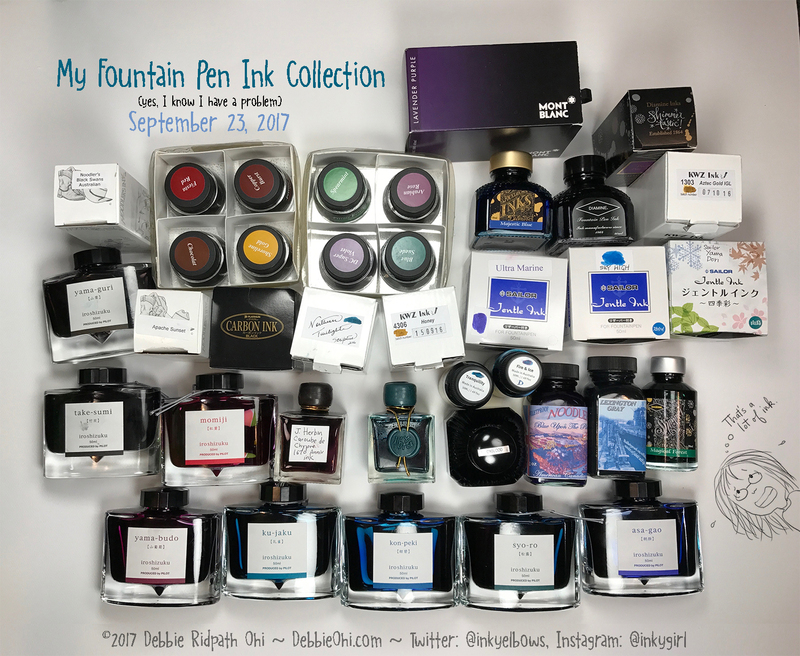 My husband gave me a bunch of ink samples from Goulet Pens for my birthday earlier this year, and I'm still working my way through them. 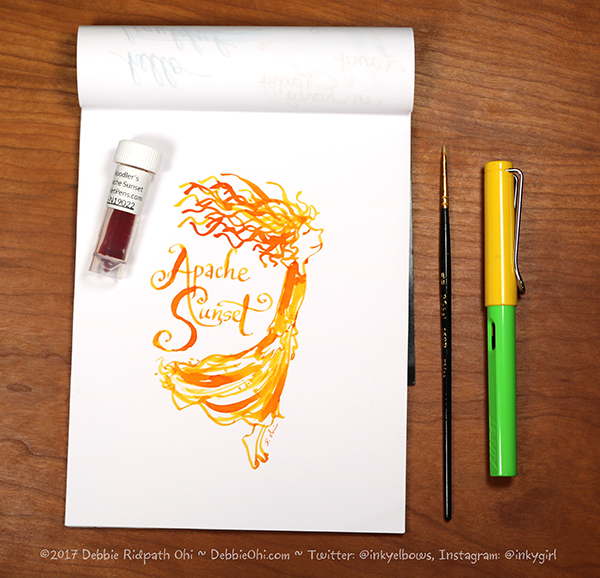 Today: Noodler's Apache Sunset. Wow, LOVE the shading. Inked up my Edison Nouveau Premiere Seaglass (a gift from my husband Jeff) with some new ink I acquired from my fountain pen enabler friend, mishie. Used a water brush to smear the ink around a bit. 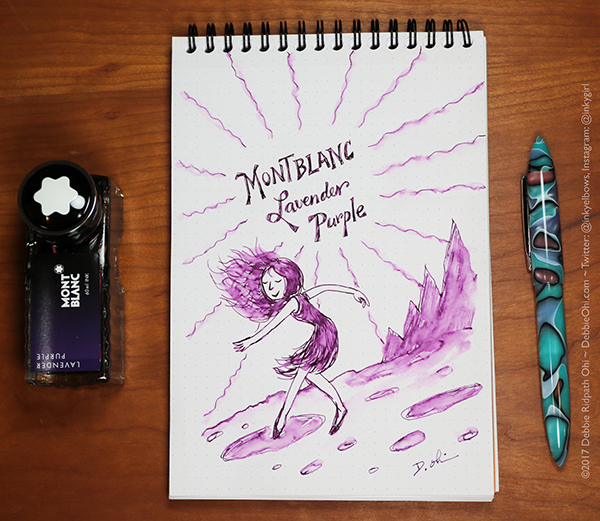 This is my first Mont Blanc ink, and I'm fascinated by the bottle shape. Does anyone know if this shape customized for Mont Blanc pens? Or just for an interesting design? Anyway, it's a beautiful colour and I'd like to try this in one of my pens with a broader nib to see how it shades. 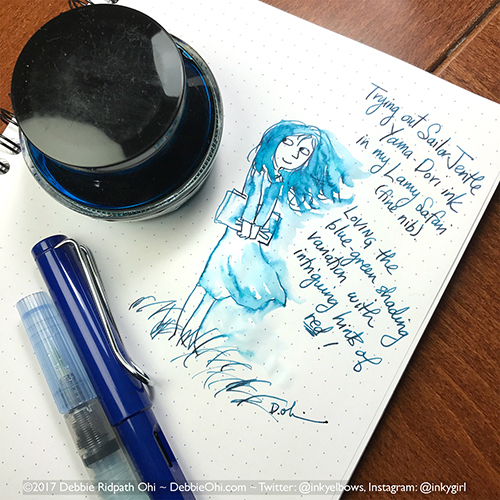 Inked up my Noodler's Ahab with the new Sailor's Jentle Sky High ink I recently acquired from mishie (aka Fountain Pen Obsession Enabler). 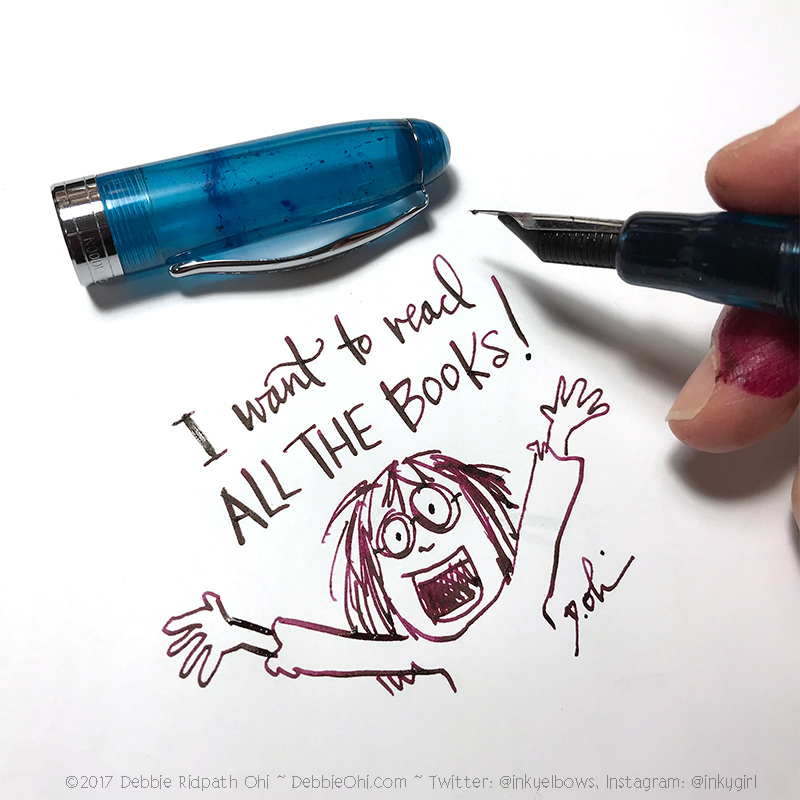 When I first bought my Ahab from Wonder Pens, I confess I was not enamoured because the nib required too much fiddling (I had been warned about the Ahab but I still wanted to try it). So I de-inked & cleaned it, set it aside for several months. Took it out yesterday to try again...and LO AND BEHOLD, I love it. It takes more pressure than my beloved Pilot Falcon to get line variation, but I don't have to be quite as paranoid about bending the nib. I also really like my Sky High ink. Some lovely shading. p.s. And yes, I WANT TO READ ALL THE BOOKS. My Husband Gave Me A Turquoise Twsbi Diamond 580Al! I inked up my TWSBI (my first TWSBI!) 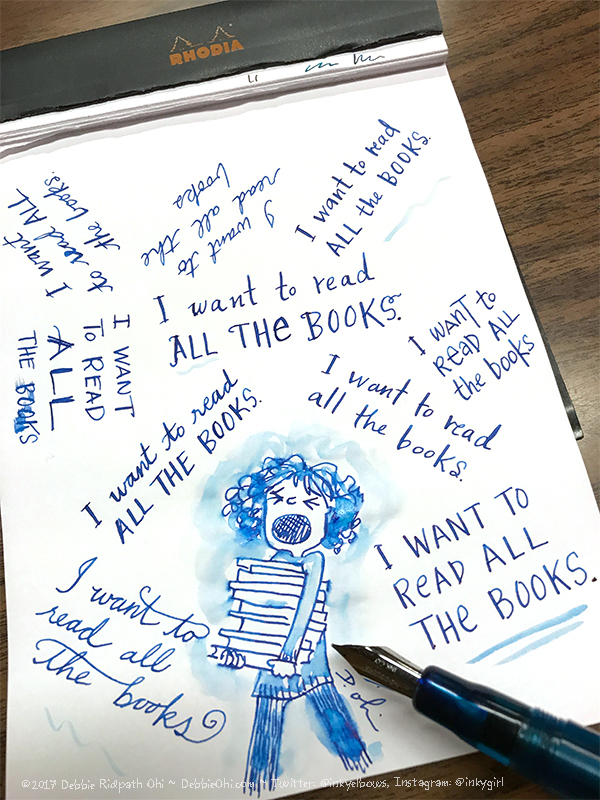 with Iroshizuku Syo-Ro and created this wee doodle. 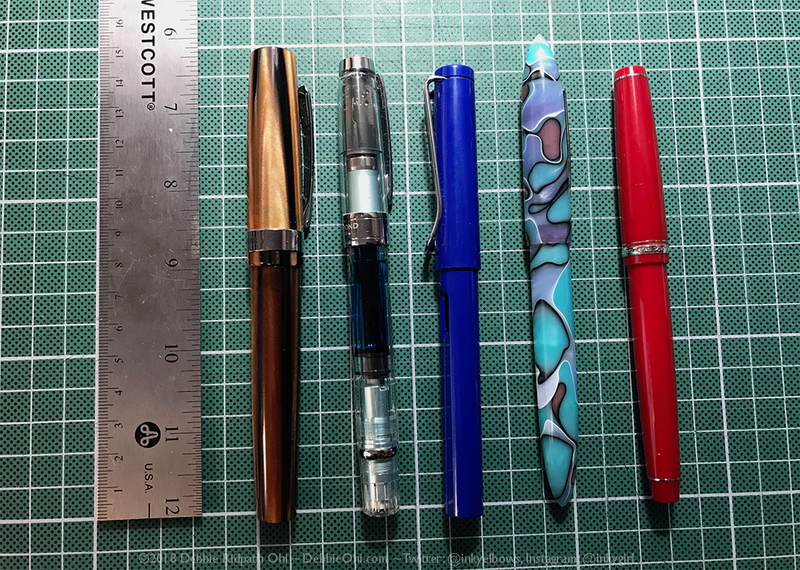 The Pilot Falcon is still my favourite writing experience, but I'm too paranoid to take with me travelling in case I lose it or someone I meet along the way (young readers, etc.) accidentally hurts my gold nib. The TWSBI is a pen I can take out to jot notes without feeling I have to be super-careful. I would be disappointed and sad if I lost it, but as much as if I lost my Pilot Falcon. 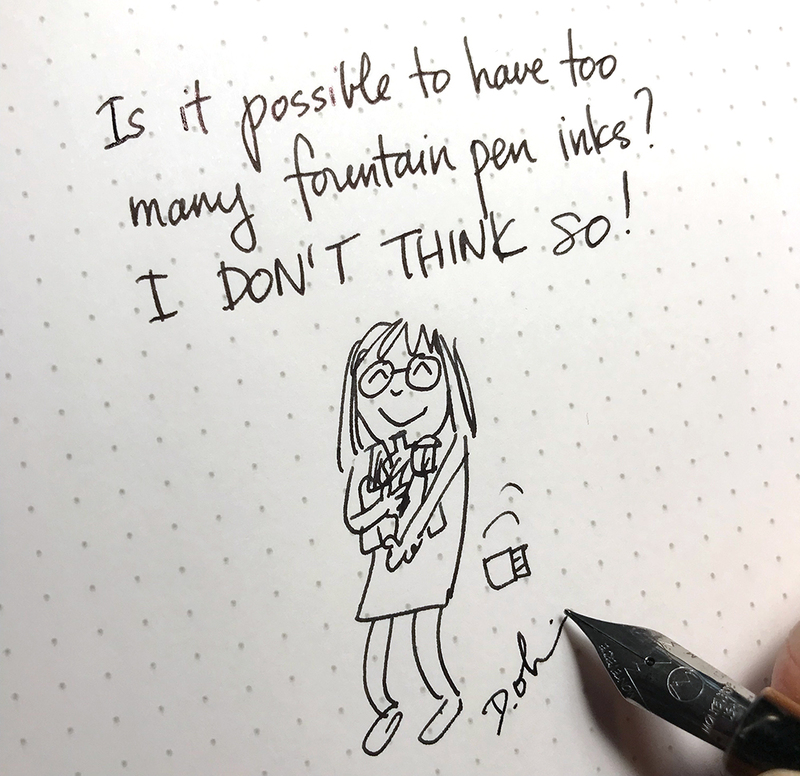 I ended up not taking ANY fountain pens on my book tour earlier this year because I was travelling with just carry-on for the week, and it would have been Very Bad if I had gotten any ink on my clothes since I wouldn't have any time to wash any along the way (I flew to a new state every day). 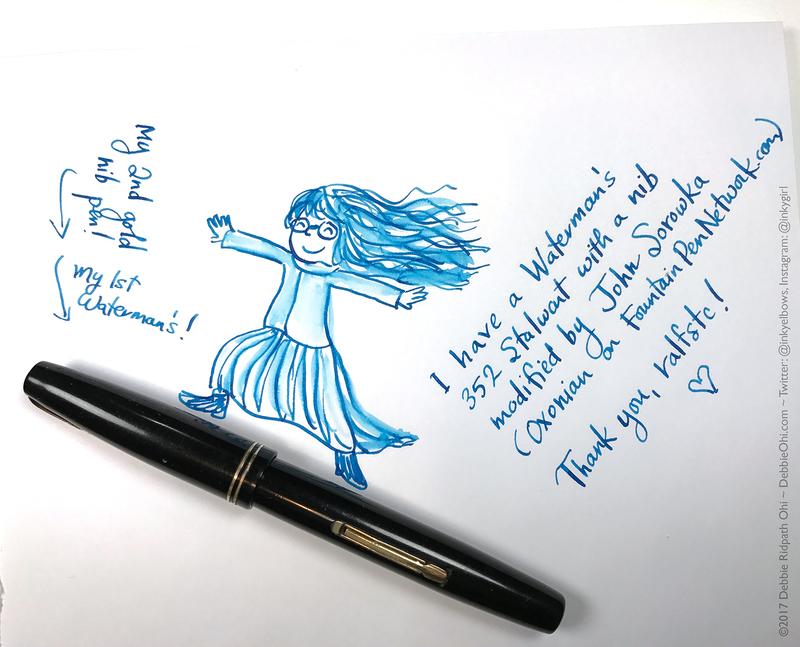 I really missed my fountain pens! 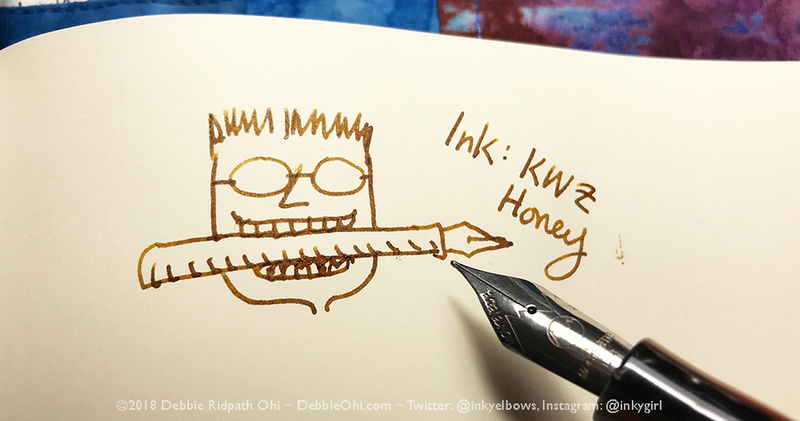 Doodling With An Inky Blotch With My New Edison Nouveau Premiere! Fountain pen artplay this morning. 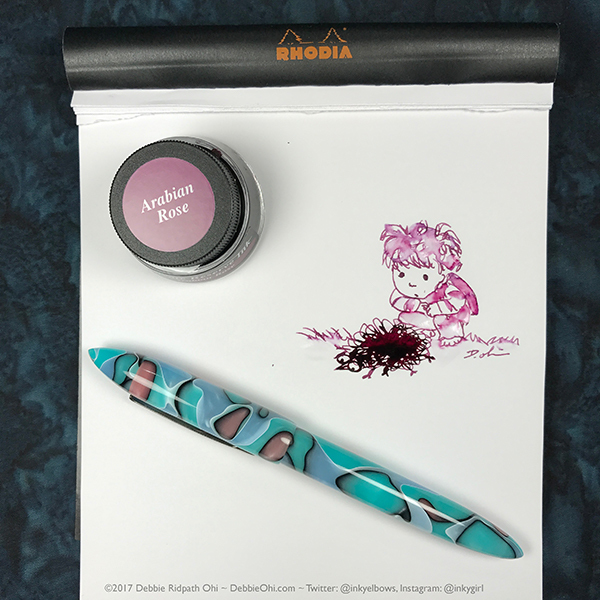 Whilst inking up my new Edison Nouveau Premiere Seaglass pen (a gift from my husband) with some Private Reserve Arabian Rose, I accidentally made an ink blotch. I decided to doodle with the blotch, of course. :-) . I love my new pen!!! 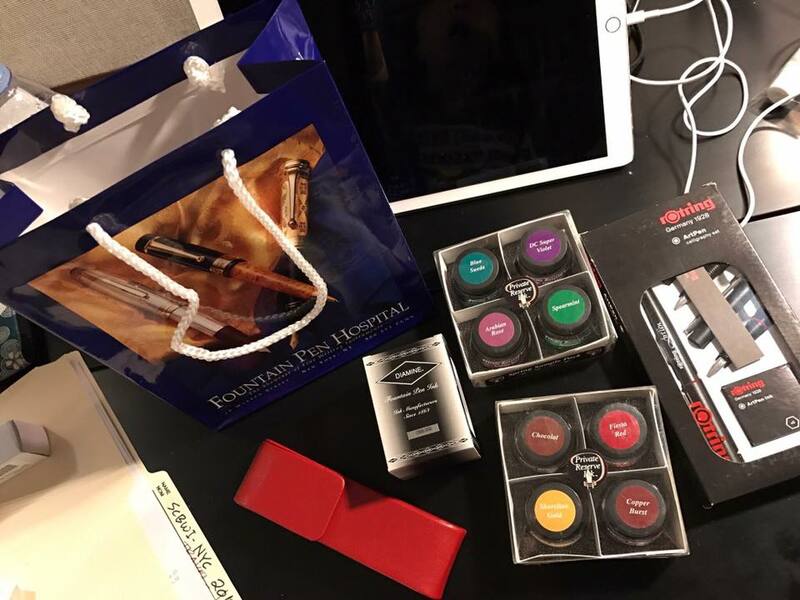 I had a chance to visit the Fountain Pen Hospital (http://fountainpenhospital.com) in Manhattan earlier this week. WOW!!! It's pretty amazing. 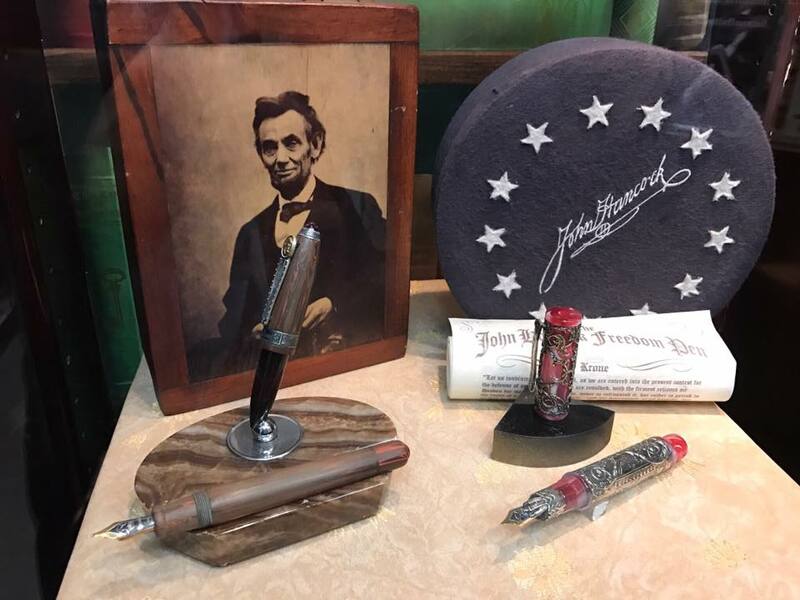 This shop was founded in 1946 and used to focus on repairs, but now carries a wide range of vintage as well as modern-day writing instruments...PLUS pens, notebooks, inks and more. Can't wait to try out all my new goodies. 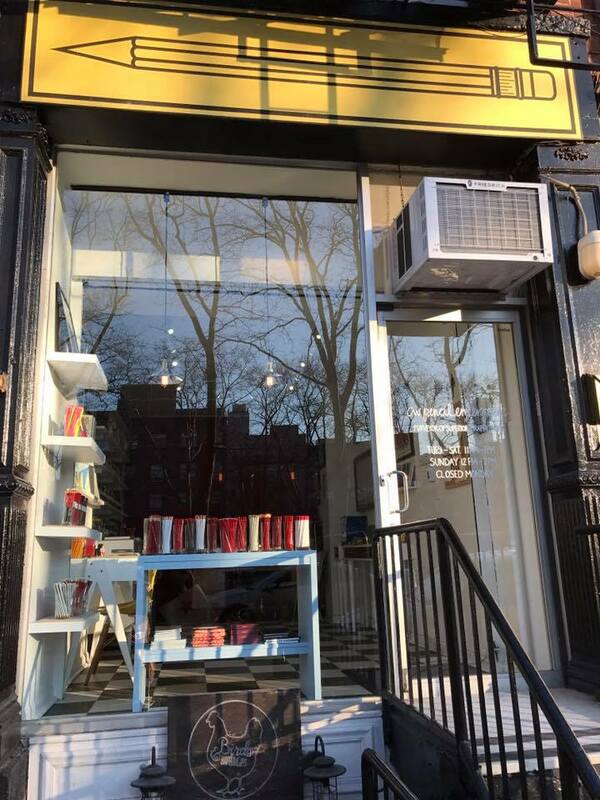 A couple of weeks ago, I posted on the forums saying that I was going to NYC for work but had a few extra hours to wander about, and asked if anyone had any suggestions about where I should go. Thanks to everyone who gave me advice! 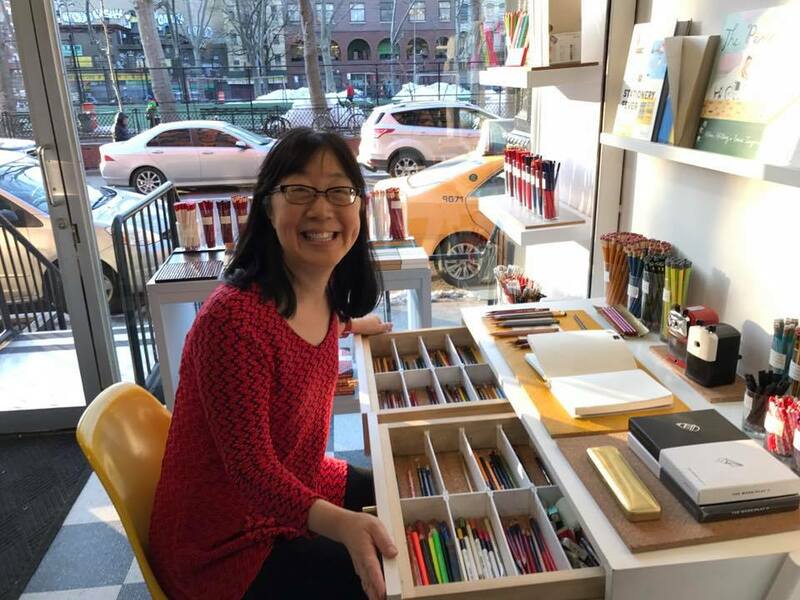 One of the places I visited was CW Pencils on 100 Forsyth St. ( https://cwpencils.com ). 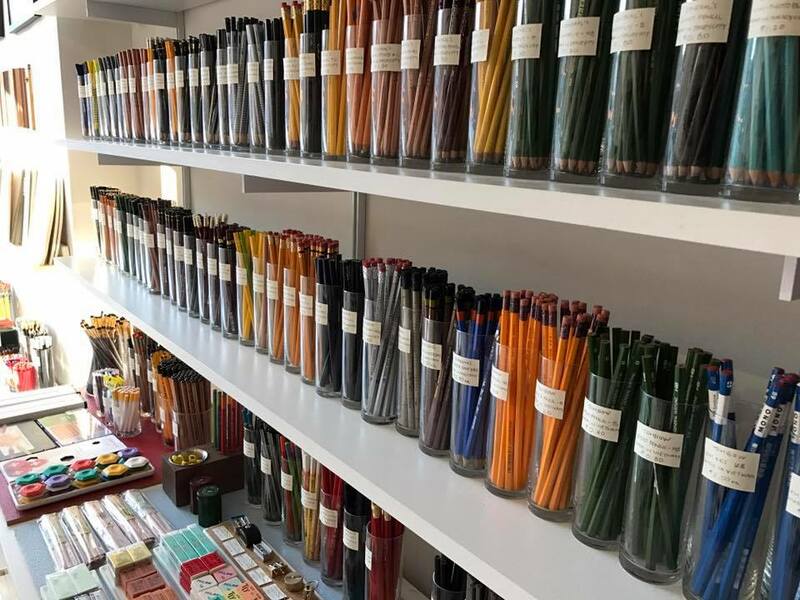 It's a tiny shop but WOW, does it have a lot of different pencils! 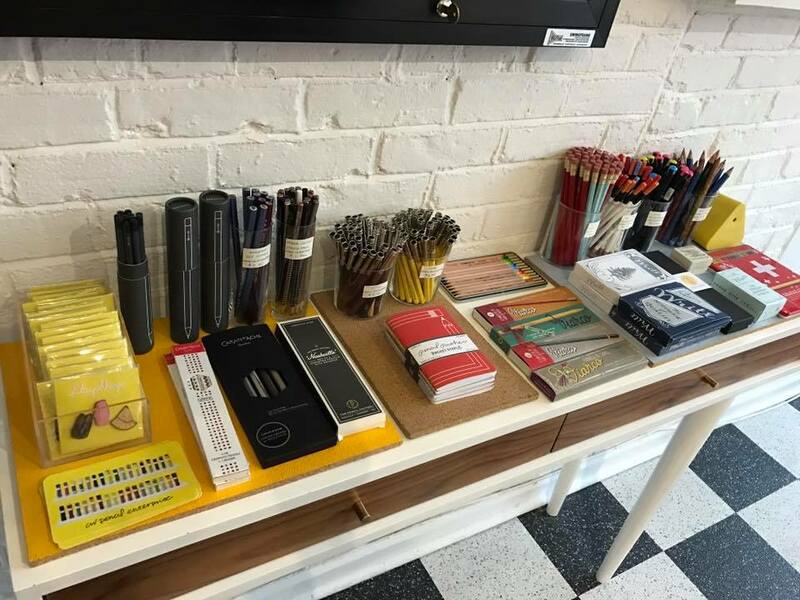 I asked the clerk for advice and she put out a bunch of sample pencils for me to try as well as a test notebook. I ended up buying a lot of pencils I can't wait to start sketching with. My pencils at home are horrible and scratchy and I am going give them away as soon as I can. 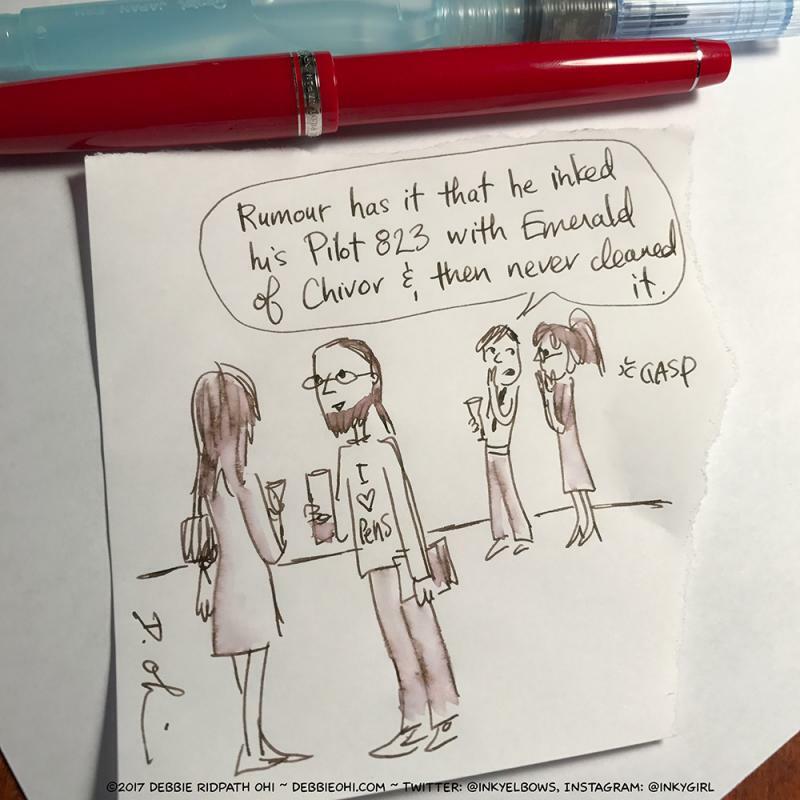 Thanks to MsRedPen for the caption! 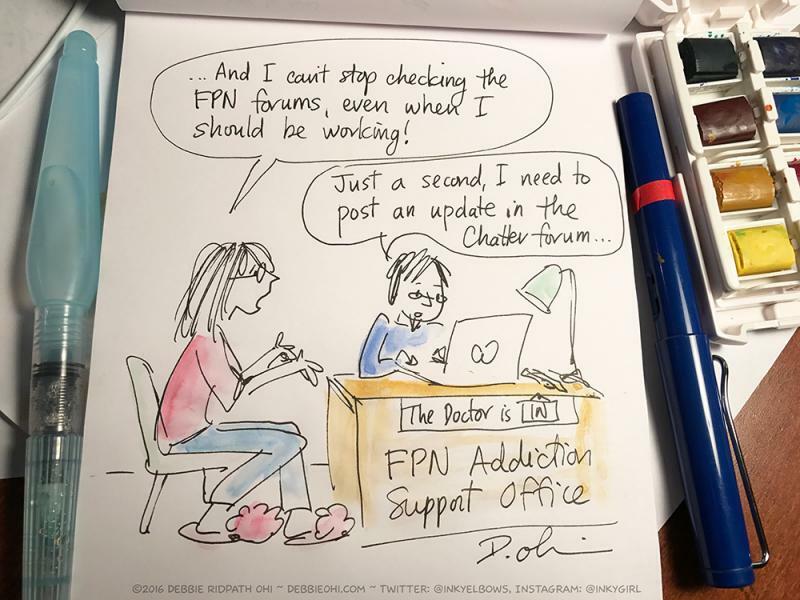 The patient in this comic does not, ahem, resemble ANYONE in real life (*cough*), of course. My first fountain pen comic! 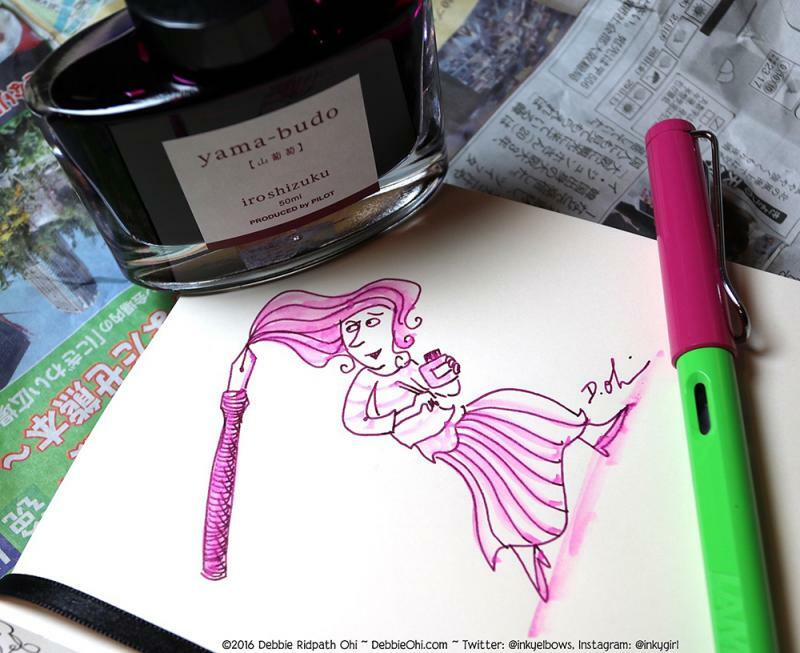 The Iroshizuku inks are expensive but I wanted to try a second ink color, so opted for Yama-Budo. Actually, I ordered Kon-Peki but the company accidentally sent me the wrong colour. I decided to keep Yama-Budo because I love the vibrancy. It's not a colour I'd use to write an entire letter but I do like the contrast to my Yama-Guri. I do still want Kon-Peki as well. 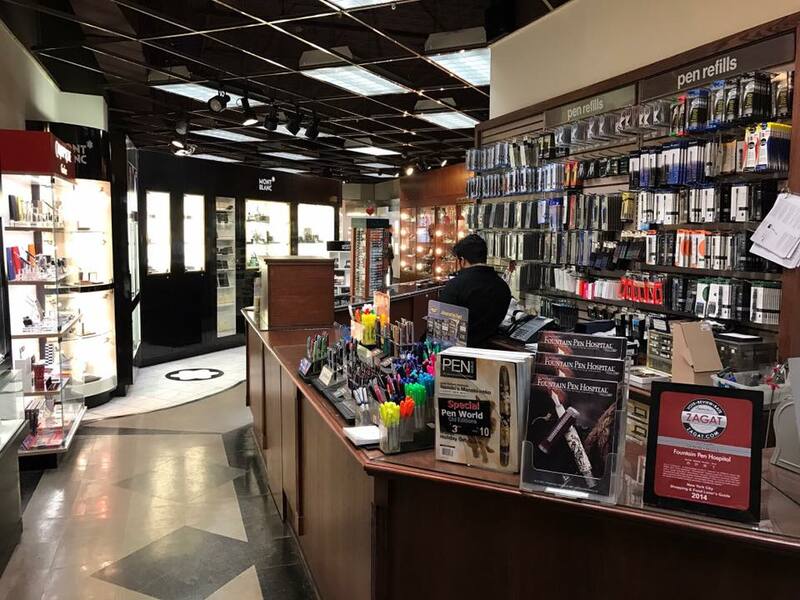 And as you can see from the photo, I did buy another Lamy Safari. Laywine's in Toronto was still having its Mix'n'Match Lamy Safari sale, so I could not resist picking different colors. 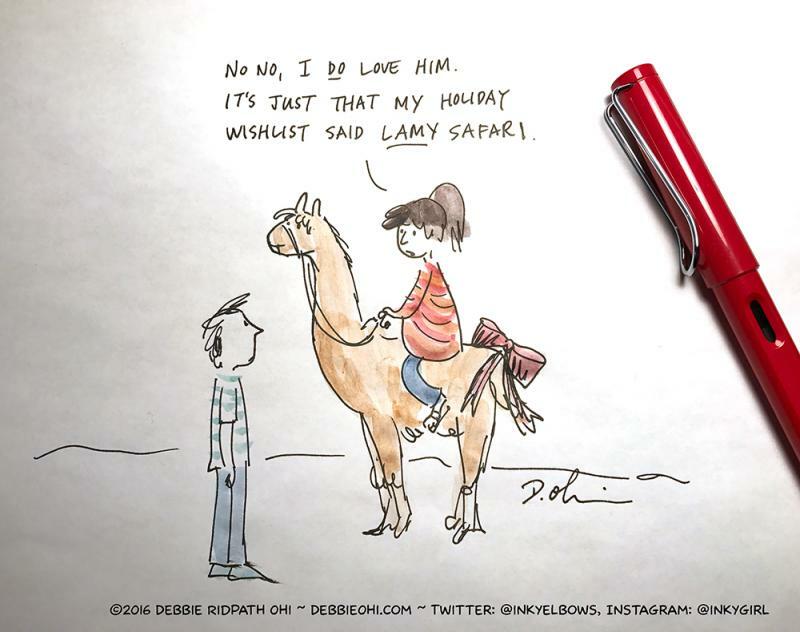 I do so love how the Lamy Safari fits in my hand, and how smooth it writes. My Very First Fountain Pen! 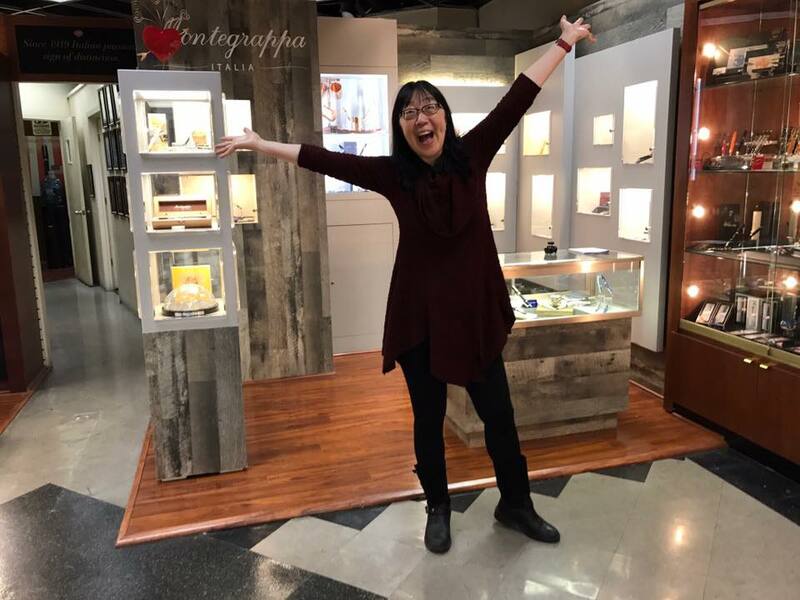 After years of believing that fountain pens were just too unwieldy and messy and scratchy for day-to-day use, my friend Michelle Leung convinced me to check out Scriptus, a Toronto pen show, in October 2016. 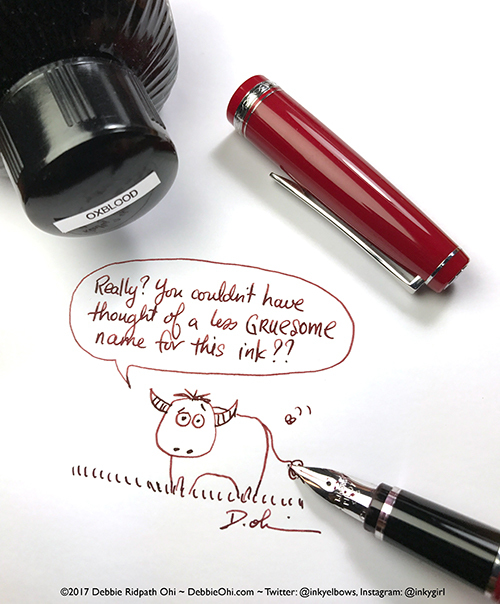 My husband came along (he's been a fan of fountain pens for years but gave up on trying to convince me) and bought me my very first fountain pen: a red Lamy Safari. I LOVE IT SO MUCH. 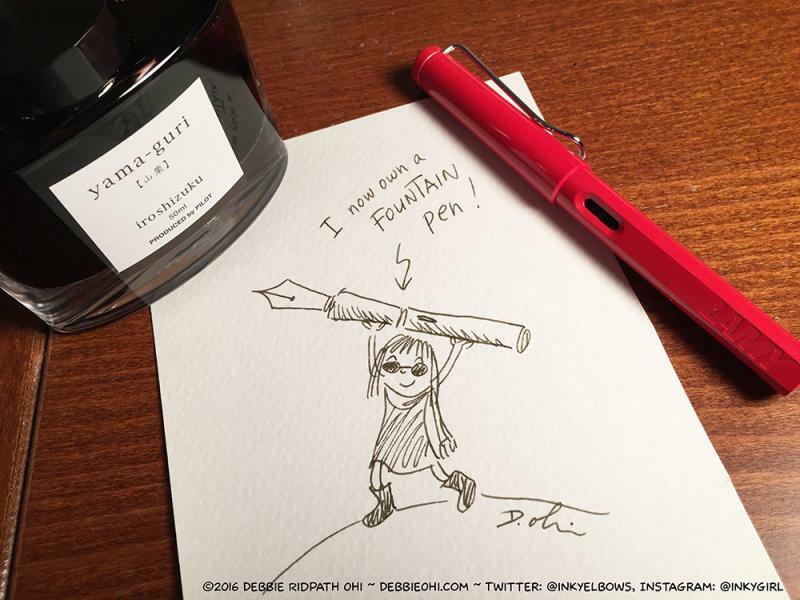 My first ink, also purchased at the Scriptus show: Iroshizuku Yama-Guri (the brand was recommended by my husband).